When people think of cosmetic dentistry, the first thing that typically comes to mind is an expensive Hollywood smile. Although that may have been the case in the 1990s, times have changed. Simple cosmetic dental procedures, once available only at a highend boutique style dental office, are now becoming more and more mainstream. years, but eventually will need to be replaced as the material ages and stains. This is normal wear and tear. dark staining foods/drinks. You can correct larger gaps and chips, and even correct crooked teeth. The porcelain is very strong, and veneers can last decades without any problems. One cosmetic solution, often overlooked, is orthodontic alignment of teeth. In the past, the only way to achieve straight teeth was with traditional braces (brackets and wires). There are now a plethora of systems that can correct crooked teeth and spaces without braces. 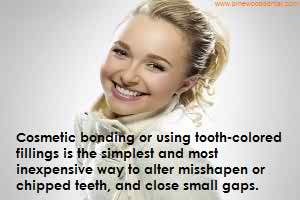 Invisalign(tm) is the most popular system out there, it is not the only system. And the most popular name brand may not be the best for you! Look around ask for alternatives and you just might save some time and money. however, the results really can give you that “wow” factor! dentist is not willing to sit down with you during a consultation and discuss your needs and wants, and thoroughly answer your questions, find one who will! Dr. Mohajir is a member of the American Dental Association, Illinois State Dental Society, Chicago Dental Society and is a Fellow of the American Dental Implant Association. He maintains a private practice in Lemont, Illinois.